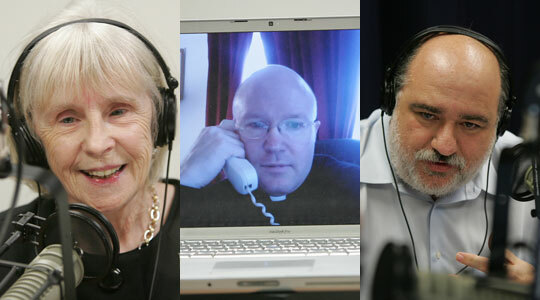 Summary of today’s show: On our regular Thursday show, Scot Landry, Susan Abbott, Fr. Roger Landry, and Antonio Enrique consider the news headlines of the week, including last weekend’s performance of Kiko Arguello’s symphonic homage “The Suffering of the Innocents” in Boston; CatholicTV’s Gabriel Award; Massachusetts as the most Catholic state; a parish’s mortgage burning to honor a former pastor; youth ministry awards; priest assignments; and safeguarding the Catholic identity of colleges. 1st segment: Scot and Susan discussed the religious education office’s Mass and graduation ceremony for the Spanish-language two-year leadership program for parish volunteers, which will occur tonight. Everyone involved volunteers in their parish and they meet every Saturday for two years from 1-5pm. They will go back to their parishes with solid foundation in theology and skills in catechetics, hospital ministry, youth ministry, and more. Scot said the Catholic Media secretariat is also working with the Hispanic Apostolate on helping them with more Spanish-language radio programming. Susan said Cardinal Seán will participate in the graduation tonight. Scot said Susan, Antonio and himself were present on Sunday for the symphony of the “Suffering of the Innocents” composed by Kiko Arguello. Antonio was one of the organizers and more than 2,000 people attended. The vast majority were Catholics, but there were also representatives of the Jewish community were present. Scot said he was moved by quotes from members of the Jewish community. “This has been moving and touching to my heart,” Rabbi Starr added. Marybeth Bisson, parishioner at Most Precious Blood Parish of Dover, also said she also was moved by the symphony. Scot heard that from many others who were present. Scot said he had high expectations and those expectations were surpassed. Antonio said the organizers were happy with how it went and Cardinal Seán was as well. He said some a Jewish rabbi told him they felt like part of the community and he felt loved. This contrasts with the old prejudices and animosities that existed at times and in some places between Christians and Jews. Antonio said these Jewish-Catholic relations are becoming more of a movement and not just theologians talking. The singing of the Shema Yisrael was a key part of that unity. They discussed how Mary is an icon of the suffering of Christ, helping us to enter into the suffering in our lives with our eye on Christ, seeing how she accepted the sword of suffering that would pierce her heart, as the prophet foretold. The wages of sin are death, as St. Paul says, and Christ takes the suffering upon himself to give us a new and different life. Mary is at the center of that renewal. Scot said a moving moment was when everyone in the audience chanted a prayer to Mary with the choir. Susan said just being in Symphony Hall was beautiful and then Cardinal Seán quoted Dostoevsky: “The prince says that the world will be saved by beauty!” She also said she was unsure what to expect from an artist who composes music, but it was so lovely. Fr. Roger Landry said Pope Benedict said the greatest evangelization force, the means by which to bring people to conversion, is the beauty of the art the Church has produced and the beauty of the saints. When God produces these great acts of beauty, it brings us to the Source of Beauty, which is God. Great symphonies, great cathedrals, great pieces of art help us to understand who we really are and become mirrors of the beauty of the Lord. When we look back to St. Thomas Aquinas, in addition to his 50 volumes of theology, he also produced some of our greatest Eucharistic hymsn we still sing today. He recognized that the beauty of God and our faith couldn’t just be expressed in philosophical and theological prosaic sentences. They had to be expressed too in poetry and music. Antonio said CatholicTV was there and did many interviews and they also taped the whole catechetical experience. He expects them to have a special program. He said the plan is to put it online somewhere. There was also discussion of how it resonated with many how the very Brahmin Symphony Hall was the site of this Catholic and Jewish event. Also, regarding CatholicTV, they were awarded Television Station of the Year by the Gabriel Awards along with EWTN. This is the second time they were honored. It shows how the two national Catholic television networks are bringing people to God. Fr. Roger said in age when so many people watch TV and watch videos on the Internet that the Church take advantage of this new Areopagus. He said both networks are doing high quality work with very good content. For many people who are homebound, this is their connection to the Church. Also, this week, a headline shows that the latest shows that Massachusetts has passed Rhode Island as the state with the highest percentage of Catholic population. Antonio said realistically it means that the Catholic population dropped a little slower than it did in Rhode Island. Antonio and Susan agreed that it might be due to the number of Catholic immigrants coming into MAssachusetts versus Rhode Island. In Massachusetts, the Catholic population is 44.9%, but what’s really telling is that weekly Mass attendance is 1 out of 6 Catholics. We should not stop until we can raise that number much higher. Rhode Island’s Catholic population has dropped by 14%. Fr. Roger said he agrees that the influx of immigrants is responsible and we have a greater responsibility because of our greater numbers. We have to help people who call themselves Catholics to respond to a renewal of their faith. To whom more is given, much is to be expected. In the spirit of care for priests and the priesthood, he repeated a message he gave in his homily. He pointed to the need for young men to step up and serve in the priesthood, and called upon lay people to encourage vocations. “It has been a great life to have been a priest. I regret that there are not more vocations,” he said. Scot said most parishes have some sort of a debt, but many leaders in Holy Family wanted to retire this mortgage as a way to honor Msgr. Glynn who had seen this parish built and worked had to put this parish in a great financial position. It’s a testament of a connection by a parish family to their spiritual father for many years. Antonio said Catholicism is about community. Community meets and gathers around their pastors. Even in canon law that pastors are to meet and care for everyone in their parish, not just the Catholics. Antonio said he’d never heard of mortgage burning before so he wanted to make sure to cover the event in the Pilot. Scot said he was struck by how much Msgr. Glynn wanted to retire this debt on behalf of the parish. It highlights the pastor’s role as both a spiritual leader, but also as a leader in the more mundane needs of life. Fr. Roger said the great pastors are those who want to provide for those entrusted to them. Msgr. Glynn didn’t want to pass on debt to his successors. Most priests leaving a parish want to leave their house in order. But it’s not just a gift to his successor but to his spiritual children, grandchildren, and now great-grandchildren. The people witness his commitment to them. Also in the Pilot this week was the annual awards banquet for Office for the New Evangelization of Youth and Young Adults, recognizing the great work being done by many people in many parishes. They honored 120 youth, young adults, and their leaders in ministry in 46 parishes throughout the Archdiocese. Antonio said everyone recognized were models of Catholic life. Susan said she was impressed by the ONE office’s organization of the event. She said one of the awards was to Marge Costa, a teacher at Ursuline Academy, who taught Susan’s daughters. Fr. Mike Harrington won an award and had a fan club of about 100 people. Deacon Jim Greer and his wife Terri won the Norm Plante Awards in honor of their work in youth ministry. Scot said the Fall River diocese also recognizes young people and those who minister to them. Fr. Roger said everyone recognizes that peer pressure among kids is a reality. These kinds of award ceremonies give positive peer pressure to lift up young people living their faith with great joy and even heroism as examples for them to follow. Fr. Roger likes to embarrass the award winners at the end of Mass by recognizing them in front of the whole community. Also in the Pilot was an announcement of five priest assignments. Fr. Shawn Carey, one of the few deaf priests in the US, has been named director of the Office of the Deaf Apostolate. Fr. Alonso Macias is leaving his three parishes in Roxbury and Jamaica Plain and is assigned to a growing Spanish-speaking community in Marlborough. Replacing him is Fr. Carlos Flor, who is moving from Immaculate Conception in Revere. Fr. Patrick McLaughlin will be leaving as administrator of St. Joseph in Medford and entering senior priest status. Fr. Bob Carr, pastor of St. Benedict in Somerville, will be accepting a new assignment soon as well. Scot said the Pilot also profiles Fr. John Delaney who’s the new pastor of Sacred Hearts in Haverhill. Antonio said he comes to the parish with a wealth of experience in that area of the Archdiocese. Fr. Delaney was quoted as saying, “1 try to live my priesthood always keeping in mind the philosophy, ‘How can I help you to get closer to God?’ My goal is to be a holy prayerful priest who is available to people to journey with them in life.” Scot said he’s extremely well-respected for his work at St. Michael’s in Andover, one of the largest in the Archdiocese. Susan said she was surprised to learn that Fr. Delaney has two Master’s degrees, one in chemistry and another in environmental engineering. 2nd segment: Scot said this week’s editorial in the Anchor talks about genuine Catholic colleges and universities. It’s been in the news lately with the decision of Anna Maria College outside of Worcester rescinding a commencement invitation to Victoria Kennedy. Pope BEnedict also spoke on this to US bishops on their ad limina visits. If Yeshiva University invited Mahmoud Ahmadinejad for a debate and discussion, it might even be a sign of magnanimity, peacemaking and institutional self-confidence. But if Yeshiva were to ask him to speak to the graduates at commencement and give him an honorary degree, everyone would wonder whether it had lost its identity, not to mention marbles. … There’s a reason why Howard University never invited — and never would have considered inviting — Strom Thurmond for an honorary doctorate. Even if in all other parts of his life he were a consummate gentleman, even if he had done many other things for many other people through public service, he would still not be invited because of the strident support of racism in his political ascent. Catholic institutions of higher learning should have as high standards with regard to potential honorees’ positions on abortion and marriage and other fundamental issues of the Catholic faith as historically black institutions have had with regard to racism. Fr. Roger said God bless Bishop McManus for recognizing this action would call into question Anna Maria College’s commitment to their Catholic identity. Bishop McManus was disinvited to the commencement by the students, which is an indication of the culture at the college. The Catholic identity needs to be reinforced there. As Catholics we can’t support the killing of babies in the womb or undermining the meaning of marriage. Catholic universities and colleges ought to be distinguished by preparing students not just for life but eternal life, not just for work but for mission, not just for LSATs, MCATs, and GREs but for the eschatological final exam. The choices that a Catholic college or university makes — selecting administrators and faculty members, allocating resources, determining admissions standards, and even choosing commencement speakers — should always be in harmony with the faith and reflect these genuinely Catholic priorities. Scot said it’s a controversial issue only because the Church hasn’t embraced the ideal we all should support Church teachings on life issues. Susan said the two examples Fr. Roger gave are good illustrations. It’s not we don’t invite people who disagree with us ever, but the context of the address is important. She noted the Pope aid young people have a right to hear the teaching of the Church. Antonio was happy to see the Pope say the key problem here is we need to witness to the faith, but we are in a moment where there is no absolute truth, but whatever we think is true is what’s important. Susan noted we have to have a well-formed conscience. Scot said bishops have a job to do to ensure that any institution that has Catholic as part of its identity live up to the ideals of the faith and don’t send out mixed messages.